The core of this technique is the same as when comparing the last two complete date parts in that we need to create a calculated field that classifies dates as “current” or “prior”. Partial periods are more nuanced, however, because they can contain any number of days from 1 to 364. You could be comparing anything from Monday this week to Monday last week or January 1st through December 30th this year to January 1st through December 30th last year. To account for these differences, we must compute the number of days in the current partial date range so we can ensure the current and comparison ranges contain the same number of days. So, in addition to our Partial Current / Partial Prior field, we need two additional calculated fields: a level of detail calculation to automatically compute the latest date in the dataset and a DATEDIFF calculation to determine the number of days in the current partial range. As of this writing, the Order Date field in the Sample – Superstore dataset only goes through 12/30/2018. I added 365 days to this field so the dates were moved up to 2019; the field Order Date is actually the calculated field [Order Date] + 365. To create the illustration that we’re working with current and to exclude sample dates that go into the future, I added a data source filter to only bring in dates through Wednesday, March 13th, 2019. By default, weeks start on Sunday in Tableau, but I usually think of weeks as starting on Monday. I have adjusted my weeks to start on Monday by clicking Data in the top navigation, hovering over the name of the data source, and changing the “Date Properties…”. For this example, let’s say it’s Thursday, March 14th, and our company updates our data once per day overnight, meaning that our dataset is current through Wednesday, March 13th. We would like to create a report that automatically compares the number of days that have passed in the current week (Monday, Tuesday, and Wednesday) to the same three days last week. Note this calculation includes a FIXED level of detail expression, but because FIXED is the default expression and we are not specifying a dimension to change the level of detail, we do not need to type “FIXED:” at the beginning of the syntax. The next calculation computes the difference between this calculated field, or the latest date in the dataset, and the beginning of the current partial date range. The first date part of ‘day’ ensures the difference between the max date and the start of the range is always computed in days, and should not be changed. The second date part – ‘week’ in this case – can be changed to month, quarter, or year depending on what partial ranges you’re hoping to compare (i.e. partial week over partial week, partial month over partial month, etc.). If the date is less than or equals the latest date in the dataset and the date is greater than or equal to the start of the current partial period, it’s classified as “Partial Current”. If the date is greater than or equal to the start of current partial period minus one date part (so the start of the last partial period) and less than or equal to the start of the last partial period plus the number of days in the current partial period, it’s classified as “Partial Prior”. It’s the last part of this calculation, “+ [Days in Range]” that caps the prior comparison at the same number of days as the current comparison. Even though there were seven full days last week, we only want to compare the first three in this case. 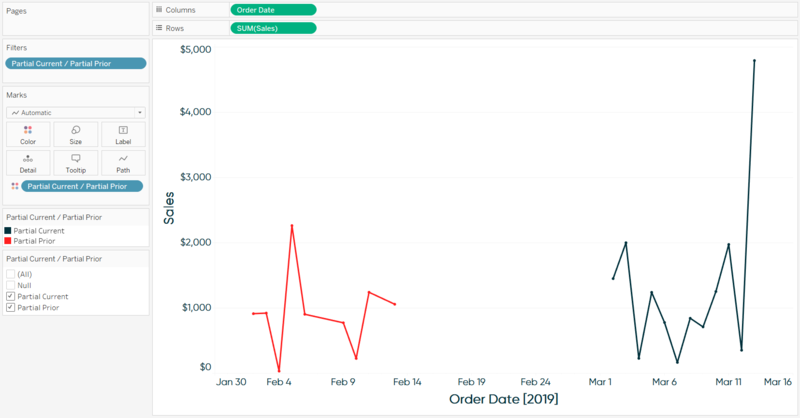 To illustrate comparing a partial current week to a partial period with the same number of days from the previous week, here’s a line graph showing Sales by Order Date in the Sample – Superstore dataset. I’ve also filtered the view to only include dates that have been classified as either “Partial Current” or “Partial Prior” and placed the Partial Current / Partial Prior calculated dimension on the Color Marks Card. We are left with Monday, 3/11, through Wednesday, 3/13 (the latest date in the data), as our current partial range and Monday, 3/4, through Wednesday, 3/6 as our prior partial range. We just created a partial date range comparison containing an equal number of days that will automatically update as our data refreshes! To update these formulas to work with months, quarters, or years, simply update (or parameterize) all of the date parts in the Partial Current / Partial Prior calculated field and the second date part in the Days in Range calculated field (but leave ‘days’ as is). Here’s another example after updating the calculations to compare partial month over partial month. After changing the date part to ‘month’, the March range spans from March 1st through March 13th, and even though the entire month of February has passed in this example, the comparison month is capped 13 days into the month to create an equal number of days. There are some missing dates in the Sample – Superstore dataset, but both ranges span from the beginning of their respective month to the 13th of the month. From here you can: (1) isolate partial current and partial prior measures to create percent change comparisons, (2) normalize the partial prior dates so they line up with the partial current dates on a line graph, and/or (3) parameterize the date part selection to quickly pivot through different date comparisons. These tactics work the same way as when you’re comparing complete date ranges, so I encourage you to learn how to do to do these at the bottom of my last post, How to Compare the Last Two Full Days, Weeks, or Months in Tableau.